Tom “durrrr” Dwan & Viktor “Isildur1” Blom will take to the virtual felt to rekindle the old rivalry that took the internet poker world by storm in 2009. At that point in time Dwan under his FTP handle “durrrr” was a well known online poker pro and out of no where we saw the rise of Blom under his FTP handle “Isildur1”. 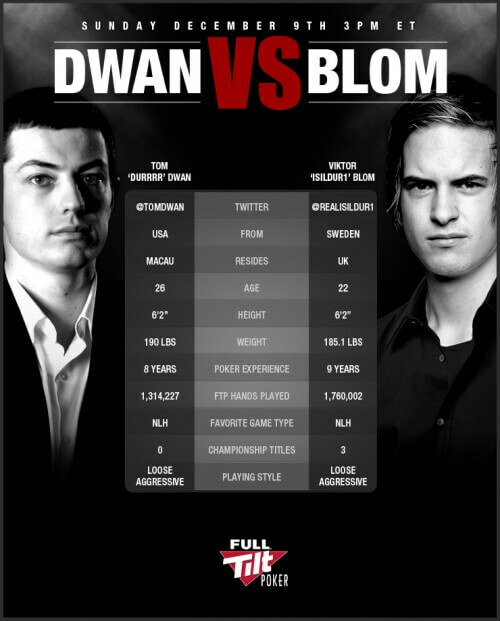 Blom at that time would play on the high stakes tables on FTP on multiple tables against some of the most recognized FTP pros at the time and dominate. The heads up matches that took place between “durrrr” & “Isildur1” were totally unbelievable due to the wild swings that took place. Both players play the Loose Aggressive style which helps fuel the wild swings. Dwan & Blom are both currently part of the Full Tilt Poker The Professionals team. Full Tilt Poker just released the following press release announcing the rivalry being rekindled. DUBLIN – December 6, 2012 – High stakes poker pros Tom “durrrr” Dwan and Viktor “Isildur1” Blom will resume their epic rivalry this weekend with each player putting up $100,000 in a winner-takes-all challenge on FullTiltPoker.com. The rematch will take place on Sunday, December 9th from 15:00 ET, with each player investing $100,000 of their own money and vowing to play until one has captured the entire $200,000. The match format will consist of four Heads-Up No Limit Hold’em tables, which will be played simultaneously. The two poker superstars first clashed across the virtual felt in November 2009, with the then-anonymous “Isildur1” emerging victorious and more than $5 million to the good after playing for hours at a time on multiple $500/$1000 Heads-Up tables several times over the course of an epic week of poker. Both players, founding members of The Professionals at Full Tilt Poker, have waited more than three years for the opportunity to compete again, with Dwan eager to win back his unofficial title of ‘world’s greatest heads-up ring game player’. All of the action can be followed on FullTiltPoker.com’s innovative game software; once the software is downloaded and an account has been created, players can search for either “durrrr” or “Isildur1” and open the tables upon which they are competing.